Nearly every business, whether brick and mortar store, online store or home business experiences a slow down or slump at certain times of the year. Many businesses see this slow down at the beginning of the year – people are trying to figure out how to pay off those credit cards that went over the limit during the Christmas season or right around tax season, when a lot of us are trying to come up with the dollars owed to Uncle Sam. Other times might be right after school lets out in the spring when families are only thinking about vacations, summer camps for the kids, etc. Others may see this slow down right at the time school starts – school clothes, school supplies, new this and new that really do take a chunk out of the budget, so other areas of spending have to be cut back. The thing to remember during these times is to recognize that these times DO COME, so to get down in the mouth, consider quitting the business, give up the website, or close your doors is nonsense! This is the time to get PROACTIVE and use the little bit of extra time to do some business promotions, get the word out about your business and prepare for the onslaught of business AFTER the slow down ends. I’m going to give you a few ways that you can become PROACTIVE to keep your business on the right track. ** If you’re in a craft or sewing business and make patterns to sell, this is a great time to use your extra hours brainstorming on new patterns that you could be working on. Because there are two of us working on this blog and both do crafts and sewing as well as making patterns, we usually are working on new craft patterns, such as the Mermaid Tail Pattern and the Athletic Non-Slip Headband Pattern, and at this time are working hard on a bunch of new patterns for our Women’s Sewing Patterns category. We’ll be having new ones coming into the store on a regular basis and we specialize in awesome designs for full figure/plus size women as well as the small-extra large women’s styles. ** Do you have a blog (Web log)? If not, this is a good time to get one started. You can write about anything you want – from talking about your personal life – letting others know how you manage to get to that stack of sewing or alterations and still take care of your family. Or you can do a sewing/personal blog to mix together what you’ve been working on as well as cute pictures of your children or grandchildren and perhaps some snapshots of your latest projects you made for the little ones. Or do a blog something like Denise’s “Shopper Strategy” that helps others save money as well as gives great information to the readers. ** Do you have something unique in your business that could be newsworthy? Have you just started a new sewing niche? Write up a press release to send to your local newspaper — they are always on the lookout for new material for their paper. Who knows – you might make the first page or even the headline of the “local” section of your paper. Think about how much this could increase your business. ** Are there some products or services that you’ve been wanting to start, but just haven’t had the time to get involved with? Now is the time to take a second look at them, write down what additional things you could add to your business, and get started now while you have the time. ** Are you one who makes craft items? From time to time we go through our boxes and shelves of fabric remnants and figure out what items we can make from them. If you love making crafty things and want to know where and how to sell them you can check out our “business books” category and specifically the “How To Sell Your Handmade Items” book. There are a LOT of places where your craft items can be sold – adding profits to your business! I would say that while you’re considering and doing any or all of the things we’ve just talked about, you’ll run out of “free” time before you know it, and you’ll be looking for an extra few minutes here and there to do another post on the sewing forums or add posts to your own blog, make that new pattern you’ve put on your “to do” list, etc. By using ONE basic pattern that you know fits well, you can make more clothes than would ever fit in your closet by just learning how to change the neckline into different styles, or how to change the basic sleeve into 10 different styles, or how to make collars to add to the basic pattern. If you’ve just found out you’re pregnant, don’t go out and try to find nice looking maternity patterns – once again, simply use the patterns you have in your sewing room and convert them into maternity styles. By doing pattern makeovers on the patterns you already own, you will be able to save probably one hundred or more dollars over the course of a year. After all, the more you save by not buying patterns, the more money you’ll have to buy fabric! All of the above mentioned pattern makeover and pattern changing classes are available in three different size ranges: Petite, Average Size, and Full Figure/Plus Size. 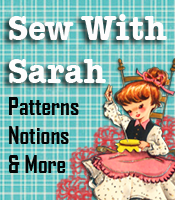 Check out all the pattern making and pattern changing classes at SewWithSarah.com – you’ll be amazed at how many clothing styles you can make from just ONE BASIC pattern that you know fits you perfectly! And, from now through March 25 ALL the pattern making and pattern changing classes will be discounted 50% by using the code change50.